Convenient Hours. Convenient Location. You Shop We Ship! its that easy. Chester, NJ. Nestled in the foothills of southwest Morris County at 95 West Main Street (in the Rite Aid Outdoor Shopping Mall), we are conveniently located in Chester at the crossroads of two major NJ roadways: Route 513 and Route 206. Holiday Shipping made easy with fast, friendly service. We have convenient hours, located on 95 West Main St. in Chester, NJ. We can print your blueprints, and so much more. We can print just about anything, just about any size. Learn more about all the printing services we offer. Looking for a private mailbox? Get one at The UPS Store with a real street address for less than $1 per day. Learn more about the features of our mailbox services. When you’re trying to make a lasting impression with printed materials, you want to consult with a local print expert. That’s where we come in. Stop by The UPS Store at 95 West Main St to talk with a real person, someone that can help you design and print that perfect flyer, brochure, menu, invitation, banner or sign. We offer a variety of printed materials and are your local resource here in Chester for all of your printing and copying needs. With shredding services available at The UPS Store located on 95 West Main St in Chester, you can get rid of your personal and business documents using one of the leading document destruction vendors, Iron Mountain®. Shred your items to help protect yourself and your business from identity theft. You can count on the printing professionals at The UPS Store Chester to help you make a lasting impression. We offer a wide range of printing and copying services to help you promote your small business or prepare for your personal event or presentation. Place your order online or stop by our store to get started. The UPS Store is your professional packing and shipping resource in Chester. We offer a range of domestic, international and freight shipping services as well as custom shipping boxes, moving boxes and packing supplies. The UPS Store Certified Packing Experts at 95 West Main St are here to help you ship with confidence. When you open a mailbox at The UPS Store, you get a lot more than just a box with a key. You'll get package acceptance from all shipping carriers, mail receipt notifications, and a real street address in 07930, not just a PO Box #. Apply today. Looking for a notary public in 07930? The UPS Store at 95 West Main St offers convenient notary services near you. Stop by today to get your documents notarized and check another item off your to-do list. The UPS Store offers convenient and affordable document shredding services in Chester, NJ, provided by Iron Mountain®. Shred your items to help protect yourself and your business from identity theft. Traveling abroad? Need to renew your passport? Stop by today to get your passport photo taken at The UPS Store location on 95 West Main St.
Get easier checkout and flexible billing for your small business. Learn about opening a house account at The UPS Store on 95 West Main St. The UPS Store Chester in Chester NJ, has been serving individuals and small businesses in the community since 2005. We offer a wide range of products and services at our convenient location with convenient hours seven days a week. We are locally owned and operated and in your neighborhood. Looking for UPS Shipping options? We've got you covered and can pack and ship your items safely with our custom packaging solutions provided by our Certified Packing Experts. We also offer options via DHL and the U.S. Postal Service. Need to return something? The UPS Store at 95 West Main St is an official UPS Drop Off location in 07930. While we're your local packing and shipping experts, we do much more. The UPS Store is your local print shop, providing professional printing services to market your small business or to help you complete your personal project or presentation. We offer mailbox rentals in Chester, NJ, document shredding, office and mailing supplies, direct mail services (design, print, mail) and even faxing. Everything for your small business, even shipping. The UPS Store in Chester, NJ is here to help individuals and small businesses by offering a wide range of products and services. We are locally owned and operated and conveniently located at 95 West Main St. While we're your local packing and shipping experts, we do much more. 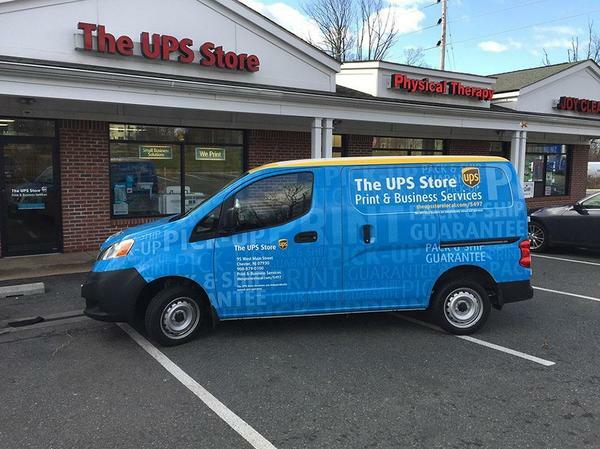 The UPS Store is your local print shop in 07930, providing professional printing services to market your small business or to help you complete your personal project or presentation. We offer secure mailbox and package acceptance services, document shredding, office and mailing supplies, faxing, scanning and more. Everything for your small business, even shipping. Chester, Long Valley, Randolph, Flanders, Far Hills, Gladstone, Peapack, Califon, Budd Lake, Oldwick, Tewksbury, Lebanon and other areas in Morris, Hunterdon and Somerset Counties. Your Small Business resource. From Business Cards to Flyers, Mailers, Brochures, Presentations, Forms, Banners, Posters and so much more. If it's important to your business we can print it! We've got you covered. The UPS Store Chester in Chester, NJ offers the following products and services.